In what seems to be sort of a ‘hey, we’re still here!’ moment, AMD is celebrating the six month anniversary of its HD 7970 GPU with a refresh. They’re raising the GPU and memory clockspeeds on the reference card and releasing the AMD HD 7970 GHz Edition. 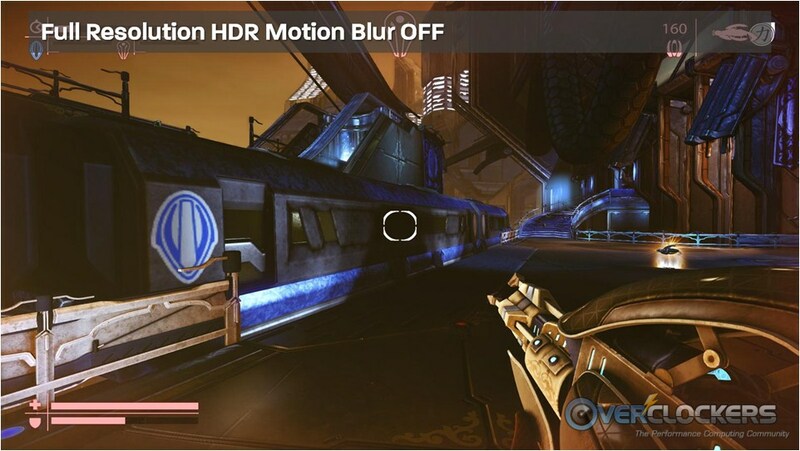 They are also touting the new capabilities of some game partnerships as well as the improved coding of their Catalyst drivers for the entire 7xxx product stack. 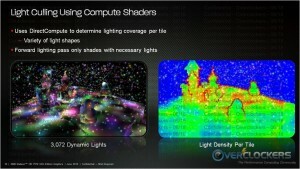 Here you have the specs of the “new” GPU. That is in quotes because there are already no less than six (one, two, three, four, five and six) partner cards clocked at or above 1000 MHz already selling on Newegg right now. The “new” part is the memory speed of 1500 MHz. Even that’s nothing to call home about really; our reference HD 7970 reviewed back in December bested that by 75 MHz (and by 125 MHz core speed). 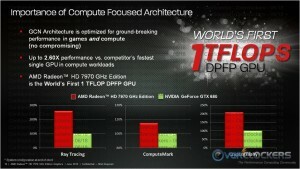 The HIS HD 7970 mdcomp reviewed walloped it at 1140 MHz core / 1920 MHz memory. To be fair, there have been process improvements that allow the card to maintain approximately the same power draw. So what they don’t necessarily “gain” in clockspeed they make up for a bit in efficiency. There may be a possibility that the improvements help cards overclock further, but that wasn’t hinted at in our call with AMD so we just don’t know at this point. Unfortunately we didn’t receive a card to review (again, not a big deal because we already know how these cards perform at these speeds minus a driver update). On the software side, things have become a little more interesting. 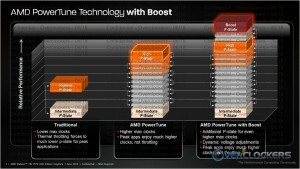 Not to be outdone by NVIDIA‘s Boost, now AMD has a Boost; PowerTune Technology with Boost to be precise. This allows the GPU to boost up to 50 MHz over stock, for 1050 MHz potential frequency. 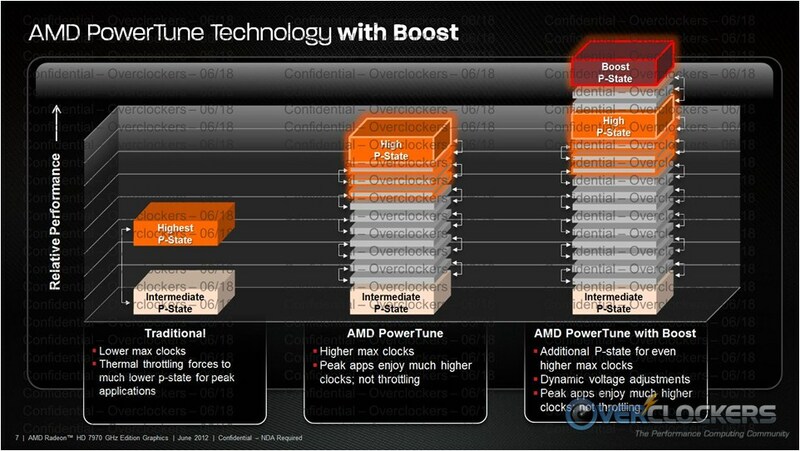 So yes, AMD now has boost too. Without the card, we can’t really say just how things change as far as overclocking goes. I certainly hope it doesn’t change much. One of the things I dislike most about the NVIDIA tech is its constant clockspeed changes. Call me old school, but I’d like to set a card’s clocks and know where it’s going to be running. Hopefully AMD didn’t go the same route as NVIDIA. 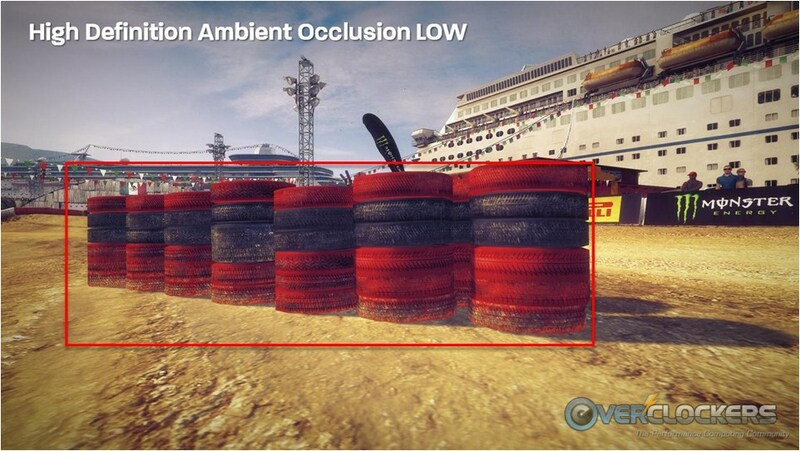 This is AMD’s internal testing against a stock GTX 680. I hesitate to put these in here frankly, without the card to test them against; but here they are. 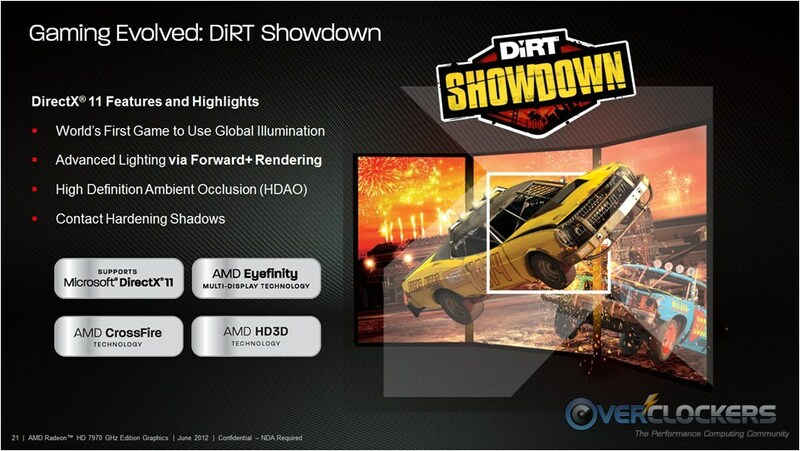 For some odd reason, AMD chose to test single monitor performance at 2560×1600. How many people can you name that run a 2560×1600 monitor? 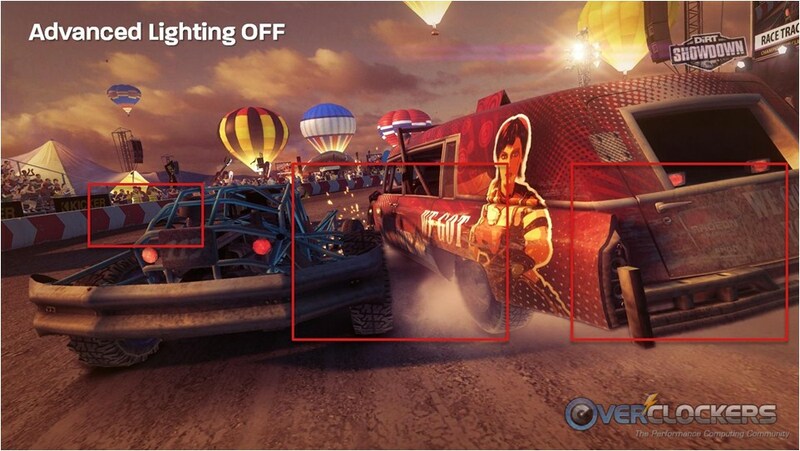 The Eyefinity graph is more reasonable, running at the standard 3 x 1080P monitor configuration of 5760×1080. 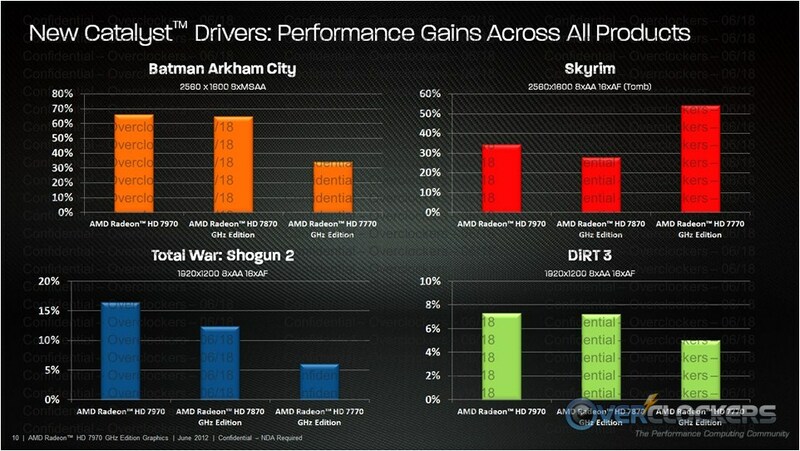 AMD never lies in their slides (that would just be dumb), so the results for the chosen games are undoubtedly accurate and look pretty favorable for the HD 7970 GHz Edition, though obviously only games where the 7970 did better were chosen. 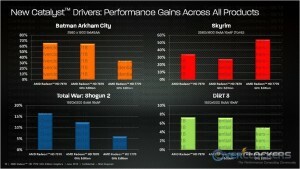 These numbers are also a combination of the higher clocks and improved drivers. 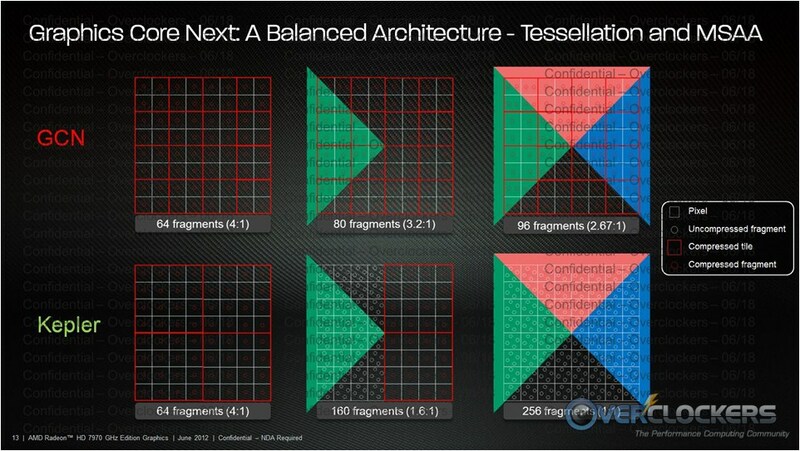 As you can see in the next slide, there have been solid gains across the 7xxx GPU stack. That wraps it up for the 7970 GHz Edition. Minus the driver enhancements, we’ve already shown how the card performs at clocks greater than what you see here, so this is far from earth shattering. Happy six month anniversary to the 7970 though. Before the GTX 680 came out, it was the unquestionable top of the heap, trouncing everything in its path. Now the two are somewhat evenly matched. 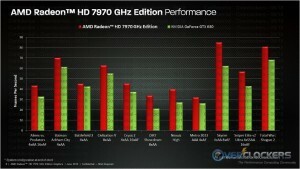 The HD 7970 GHz Edition will be available as early as next week by various partners and is expected to retail for $499. Considering several of the cards linked above are already at that price point or cheaper, the GHz Edition probably won’t be flying off store shelves. Interestingly, as this piece was going through editing we received an email from Sapphire announcing a couple intruiguing sounding future products. Following the announcement by AMD of the availability of the HD 7970 GHz Edition, the latest product using its highly acclaimed Graphics Core Next (GCN) architecture, SAPPHIRE Technology, one of the World’s leading manufacturers and a global supplier of graphics cards, is happy to announce that this latest generation of GPUs from AMD will form the basis of several cutting edge new models. Within the next few weeks, SAPPHIRE will introduce the eagerly awaited TOXIC Edition and Vapor-X models in its HD 7970 family. The TOXIC Edition is a limited edition factory overclocked model – delivering best in class performance and targeted at the enthusiast. The Vapor-X models use SAPPHIRE’s exclusive Vapour Chamber cooling technology to deliver optimised performance whilst retaining low noise and cool operation. 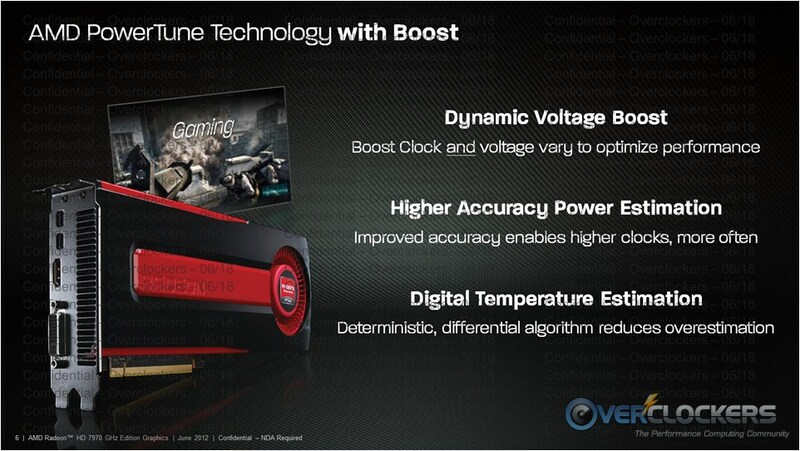 So it seems the improved process may indeed lead to more overclocking headroom, which is good news for sure! AMD is quite proud of GCN, and for good reason; their compute engine is strong and they’re working with more and more software makers to use it for OpenCL and OpenGL acceleration. 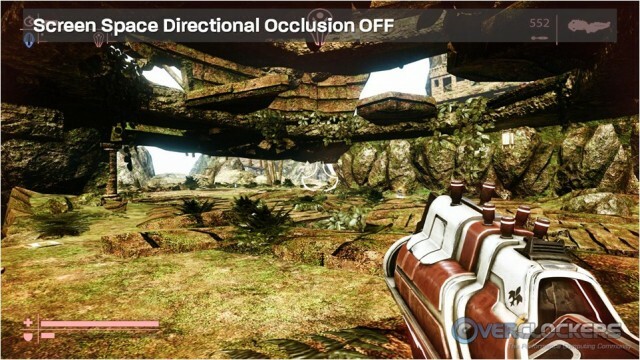 They’re also working with game developers to bring new technology that makes use of its abilities. 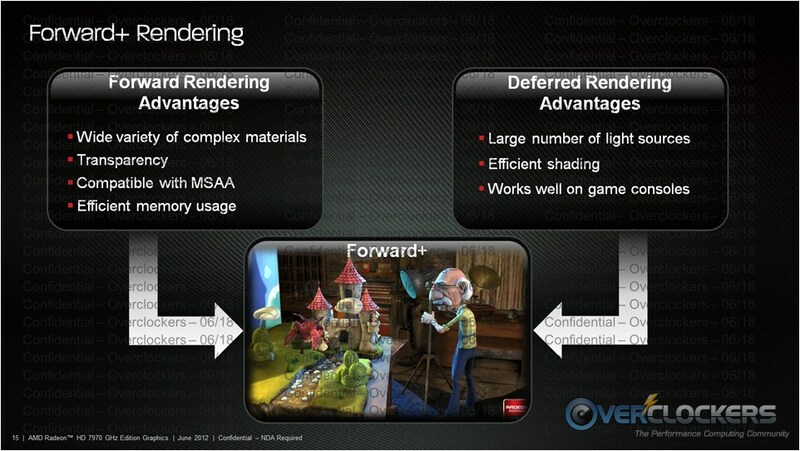 Part of the reason GCN does well when computing game graphics is its use of compression, as noted in the slide on the left. They’re also proud of the fact that, while NVIDIA is stepping back from compute to focus more on gaming, AMD is stepping up in the compute department, still offering both rather than forcing a choice of one or the other. 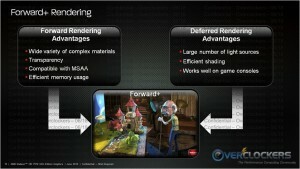 They are also introducing Forward+ Rendering and Light Culling. 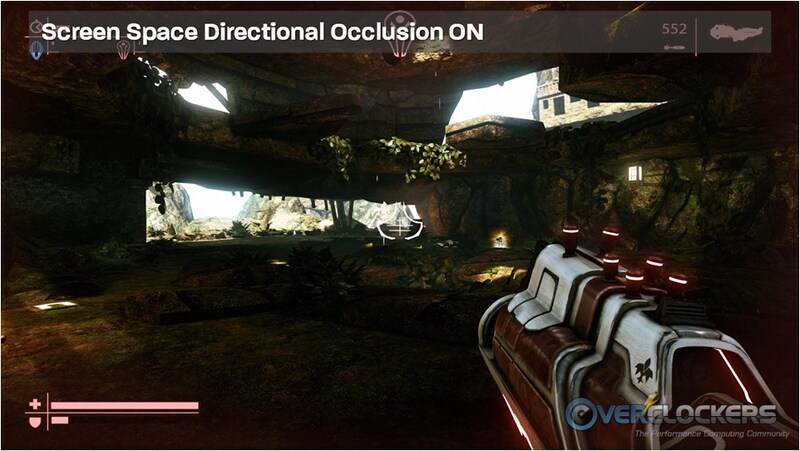 Both of these lead to some very nice lighting eye candy as well as giving developers more choices of material types. 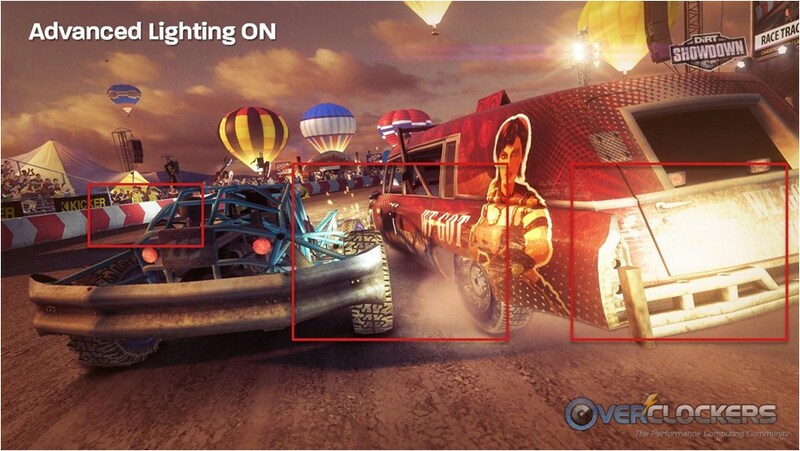 AMD is working with game developers to bring these new technologies to their upcoming titles. 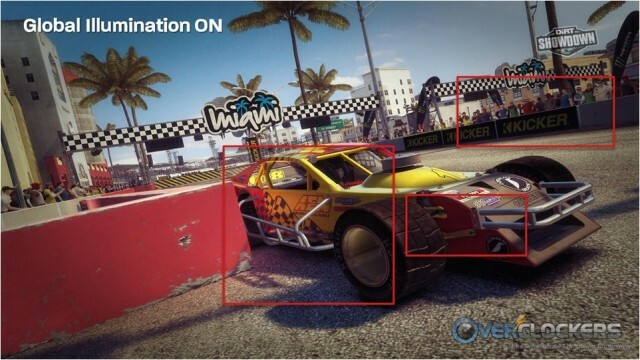 We were given screenshots of two games to show the improvements the new GCN-based technology can bring, starting with DiRT Showdown. 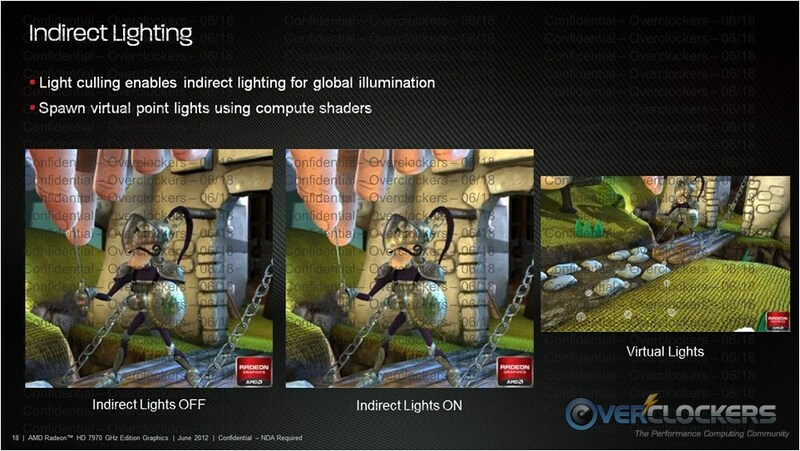 Global Illumination helps enhance, well, global illumination. This is a smaller difference than Advanced Lighting, but it’s a nice addition. 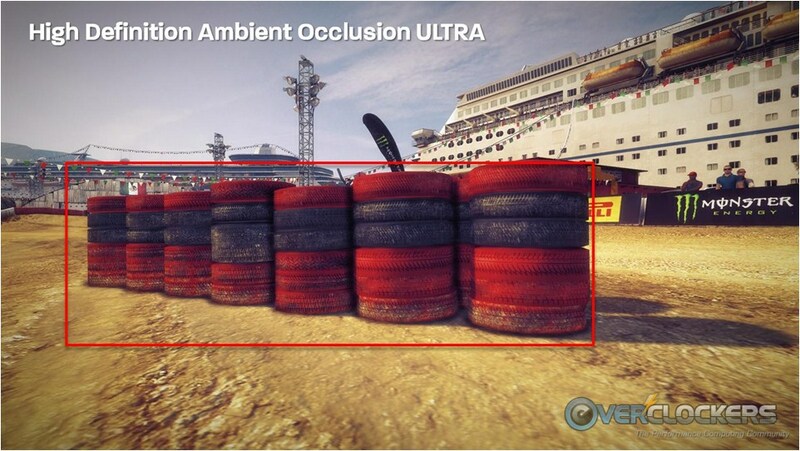 High Definition Ambient Occlusion is a mouthful, but in their screenshots it simply means better, much more realistic shadows. 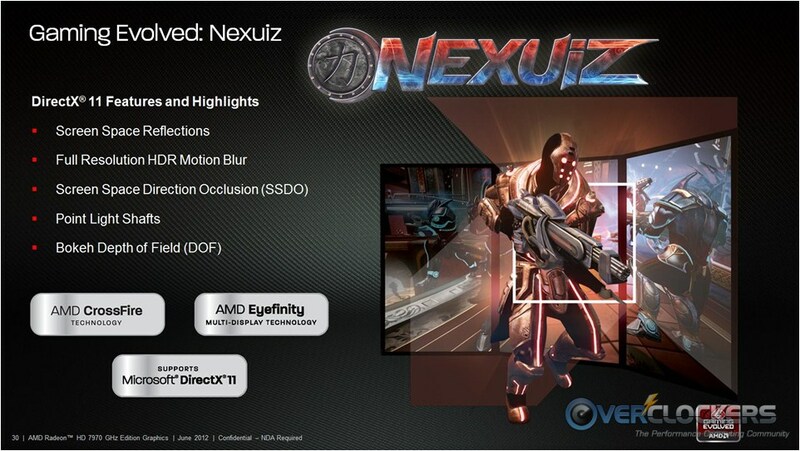 The next game they’re showing is NEXUiZ, a first person shooter. 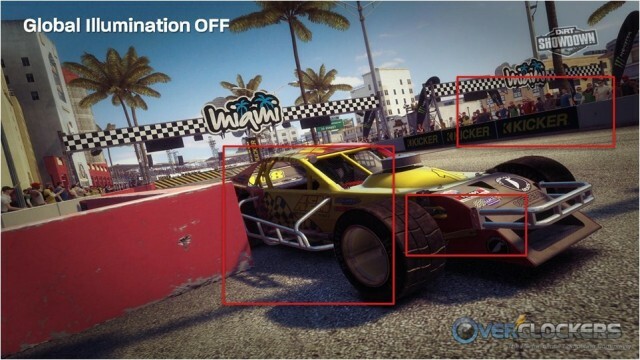 Full Resolution HDR Motion Blur looks good in a still shot, but I’d have to see it to tell if it makes that big of a difference in-game. 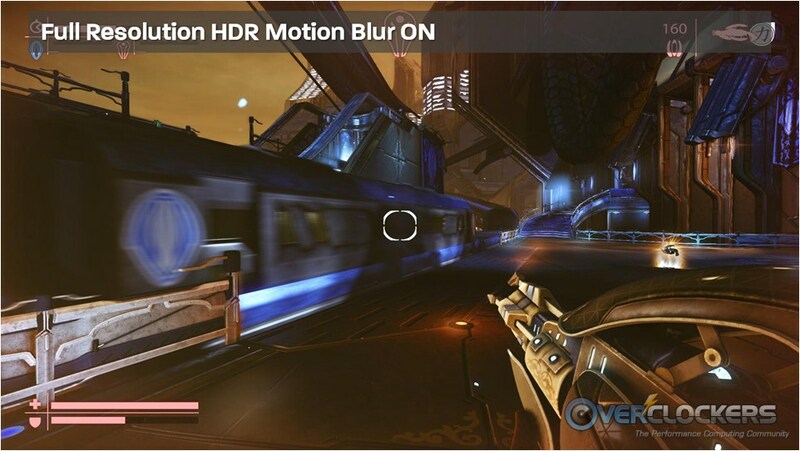 The train would be moving in the game, so it would be blurry in your vision anyway. It definitely makes for a more realistic screenshot though. Screen Space Direction Occlusion is pretty great actually, making the lighting in this environment a lot more realistic. 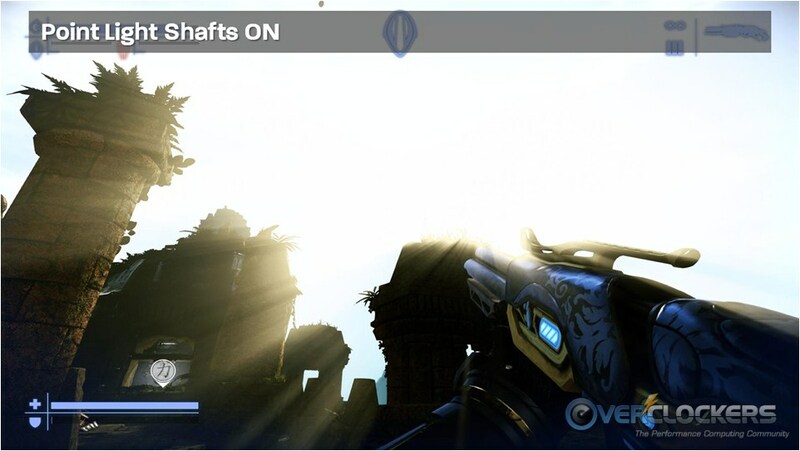 From a gaming perspective, Point Light Shafts strikes me as kind-of meh. How often is the sun in your field of view? 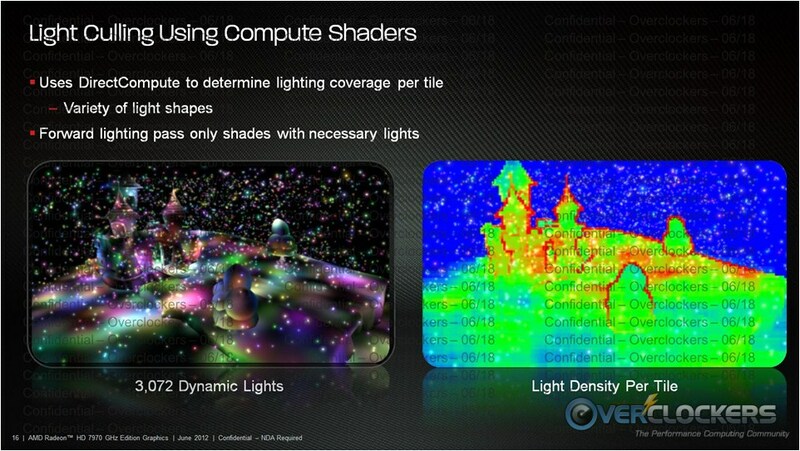 …and do you really want light shafts throwing off your vision? More realistic? Absolutely. Good for surviving? Maybe not-so-much. This last example of Supersampling & DirectCompute AA (from Sniper Elite, another new title) does a great job of getting rid of jagged edges, but doesn’t MSAA already do that? This is another one we’d have to see the implementation and how it compares before making a snap judgement. Lastly, AMD wants to stress that they are continually working with developers to help bring OpenCL and OpenGL acceleration to their programs. The list continues to grow and it’s one reason AMD considers their GCN architecture superior to Kepler, which backed off on the compute side relative to Fermi. AMD says they are stepping in with compute as NVIDIA steps back and they’re working on bring forth a software universe that helps them with that mission. So there you have it. Happy six month anniversary HD 7970 (and one year for the GCN Architecture)! It has been a long technology-advancing six months. 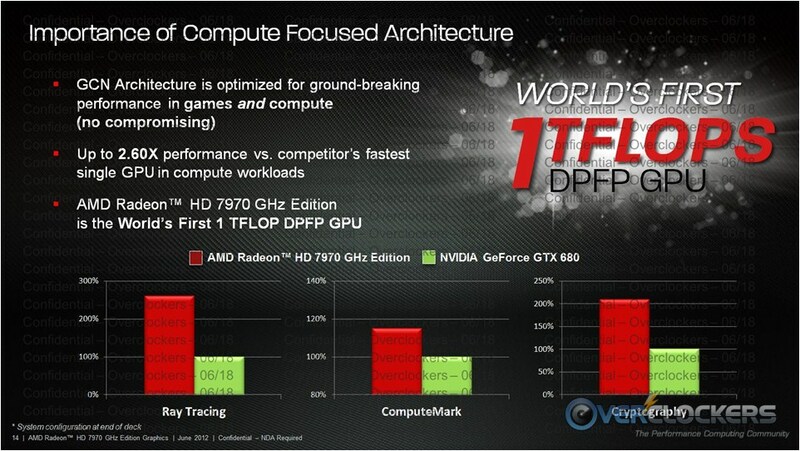 Here’s hoping AMD chooses to release an HD 7990 to wow us again. Then, of course, who knows what the 8xxx series will bring when it comes? 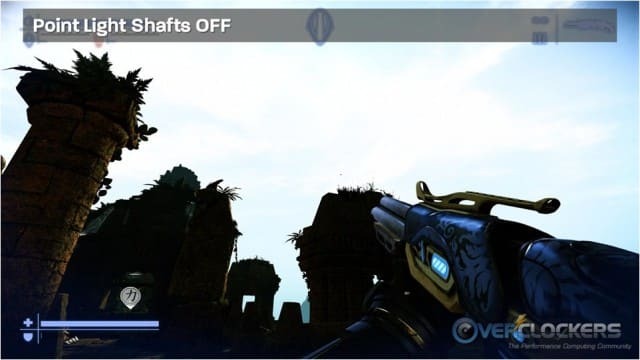 With the new game tech shown above, I’m sure looking forward to seeing what they come up with. What's with the overkill on the watermarks in the example images? 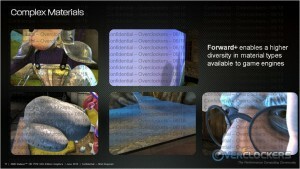 They're supposed to show the difference between different technologies but you can't see anything with the watermarks all over the pictures. Blame that on the fools that break NDA. We never have (and never will), but everyone is now saddled with those watermarks. 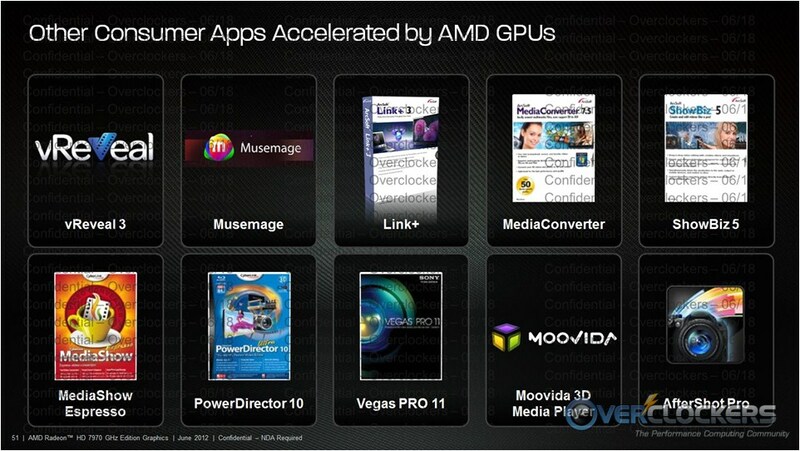 I see, so those were provided by AMD? Maybe they should just skip those next time because you can't see a thing. It's ironic considering you're supposed to be looking at the difference between the two sides in the pictures. I fail to see how a minor overclock is worth an NDA and crazy watermarking, personally. I have the XFX Black Edition which is clocked at 1000 already. In CCC it goes up to 1125. I would think they would try to go a bit higher to stand out a little more? My opinion anyway. AMD needs Nvidia, and nVidia needs AMD. without one the other, we be left with rotten GPUs. haha. Oh well, the potential to make the 7000 series much faster using improved drivers is not new to us i guess. AMD had kinda crappy drivers and i even think that they can match Nvidia products easely when they finally get the drivers right. 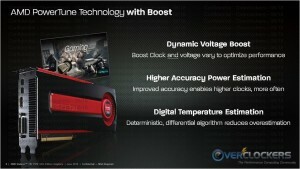 However, after reading some reviews that card seems like a overclocked 7970 without any other advantages. Because the power consume is kinda insane, although a stock clocked 7970 is about same efficiency such as a 680 GTX. The GHZ edition does indeed offer impressive performance and can regulary beat the 680 GTX, however, because its just some high clocked 7970 and not a revolutionary "power save design", i consider it as AMDs rather pointless strike against Nvidia. Although kinda funny how those 2 competitors are able to enrich the GPU market, without them, IT would be not half that entertaining, and much weaker GPUs on the market. The main improvements however, seems to be done with the newest driver improvements AMD was able to execute. 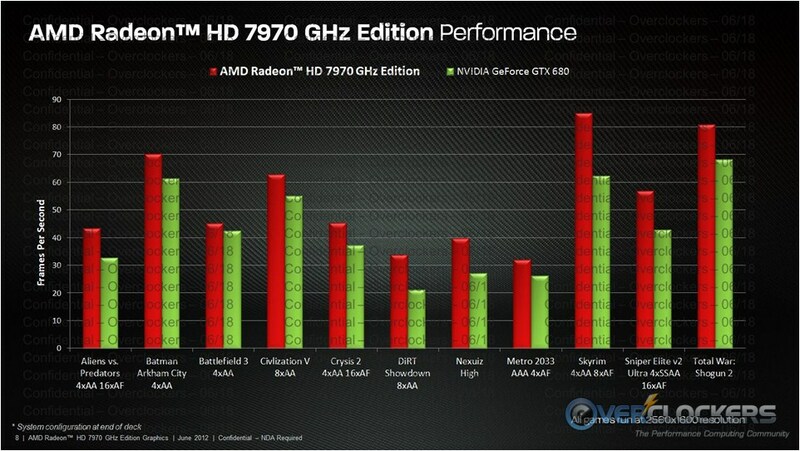 Those improvements does even hit the usual 7970 and the entire 7000 series. 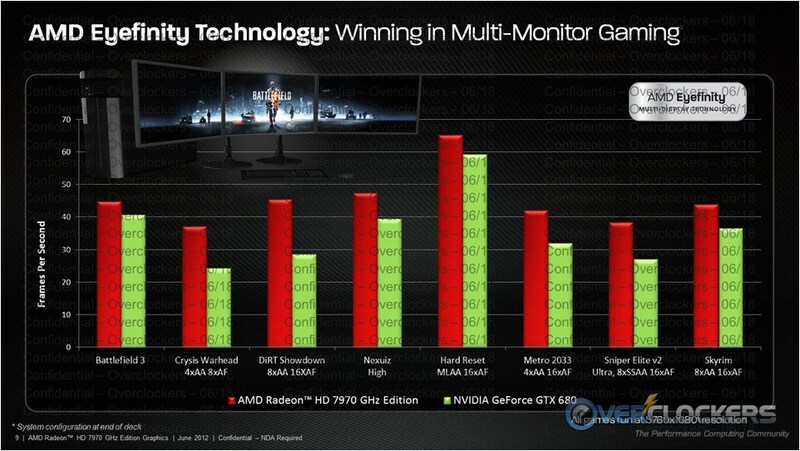 Its fun to see that the 7970 got much closer to the 680 GTX, way to close... Nvidia truly have to watch theyr back. 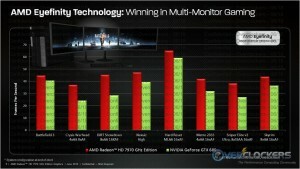 Nvidias superiority is currently only focused on the 690 GTX, thats certain, the other cards are at a harsh competition. 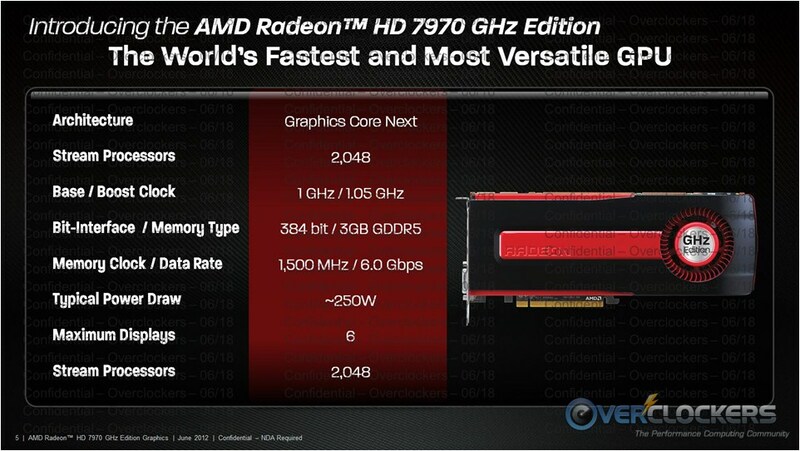 Why AMD isnt releasing a dual GPU i dont know but i guess AMD is way to busy with different matters and its probably not so easy to cool that card down... because the 7970 seems to run hot and 2 of them is lot of challenge. 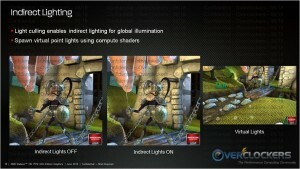 Under the image for Deferred Rendering Advantages, it says "Works well on game consoles". So where is the PCI-E slot on xbox 360 and PS3 so I can use a 7970? 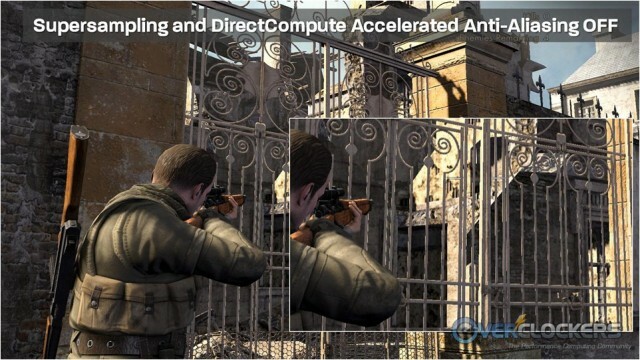 I think the GCN architecture as a whole is meant to run great on consoles, which makes sense taking into account that probably all next gen consoles could be running with AMD chips. One of the main issue game consoles got is the lack on RAM. Using those rendering technologys apparently the required RAM amount can be lowered. Not that a console is up to the task anyway, its impossible in term a hardware is specified to run up to 10 (!) years. Having a upgradeable game console makes no sense however, because then we have kinda the same situation such as we got on PC today. Some users will have a crap console and other user will have a jet engine. That would undercut the whole idea of having a standardized hardware. ;) Its not even possible to develop games with max efficiency in mind in a way like that. Because on PC like half the performance is wasted just in order to support countless of system specs. Its not possible to make the "perfect" programing like that. One of the secrets why MAC OS runs more secure and stable is because of the narrow minded hardware support. Console is even more narrow minded for a reason. While I do feel obligated to point out the memory upgrade you could buy for the N64 as well as the FX chip in some SNES cartridges, I actually agree across the board with what Ivy said. GCN as well as the entire APU concept smells strongly of future console guts. Does anybody else remember the days of directX vs specific APIs? Same game and card in Rendition mode (of 3DFX mode) was a lot faster than in DirectX mode. Even OpenGL gave DirectX rather of a stomping. These days I'm sure DirectX is better, but if games were written for specific cards the performance on those cards would be staggering. On the flip side, performance on anything else would be terrible or impossible. As a final note, given that the Xbox systems run PC hardware inside (more or less) it's theoretically possible to add a PCIe slot. In reality it'd be horrendously difficult and expensive (read: Horrendously expensive and expensive), but it would be possible. The first Xbox was some sort of weird PC. The newer consoles however got a custom design which is that far away from PC board that it is in no way compatible with foreign PC parts. The next gen consoles could be even more complicated (stuff such as dual GPU) and a design which is far away from a usual PC setup. I'm thinking from the standpoint of it being a PC CPU and northbridge, the really hard part would be making a PCB to remount the NB on to bring out the PCIe lanes. The arguement can be made for reference clock vs factory OC cards in this case though. It's good to see them unlocking more of the potential for some of there own goodies to set themselves apart.